Laura Livesey (Arts development team) came into school during the Summer term last academic year and worked with each class, involving every child in an art project. Together, our children produced 'Lowry inspired' canvas prints with each child's face featured (photograph) as one of the lowry characters. The prints highlight what our children believe to be the important values of our school. 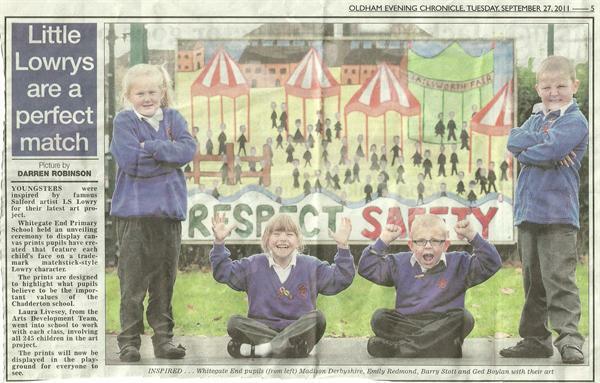 Photographers visited the school and these pictures have appeared in local press. Contact the paper concerned if you wish to order a copy of any photograph featuring your child.